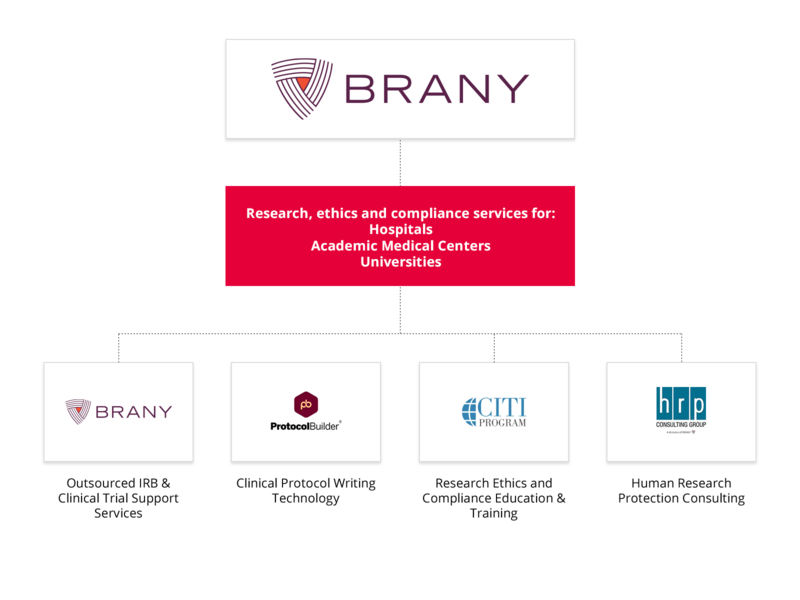 BRANY is a national organization providing a continuum of research support services to investigators, hospitals, universities and academic medical centers. Our services include clinical trial support services, IRB review, ethics and research compliance training and consulting. BRANY’s also provides web-based technology solutions including SMART, a clinical trial management system, and Protocol Builder, a clinical protocol-writing application. BRANY was founded in 1998 by four nationally-ranked academic medical centers: NYU School of Medicine, Montefiore Medical Center, Mount Sinai School of Medicine (now Icahn School of Medicine at Mount Sinai), and North Shore-Long Island Jewish Health System (now Northwell Health). BRANY IRB was the first IRB in New York to be accredited by AAHRPP in 2006. BRANY is a national organization that supports institutions, sponsors and investigators involved in research in a wide variety of therapeutic areas, medical devices, biologic and diagnostic trials. We offer IRB/IBC services that provide efficient review processes and clinical trial solutions that help maximize revenue. Founded in 2000, CITI Program is the leading provider of research ethics, compliance, and professional development education. Their online courses are used worldwide by over 2,200 organizations and more than 1 million learners around the world annually. CITI Program is dedicated to promoting the public’s trust in the research enterprise by providing high quality, peer-reviewed, web-based educational courses in research, ethics, regulatory oversight, responsible conduct of research, research administration, and other topics pertinent to the interests of member organizations and individual learners. With over 150 years of combined experience in human research protections, HRP provides services including the development of human research protections programs, training and education, assistance with accreditation, IRB administration and auditing. Protocol Builder is a secure, cloud-based application that makes the protocol writing, review, and approval process more efficient. Developed and powered by BRANY who partnered with top investigator-initiated protocol writing professionals and usability experts to develop this technology. BRANY’s Protocol Builder Team has worked together with potential users to ensure it is easy-to-use and focused on meeting the needs of novice to more experienced writers.